Poutine is a Canadian food that is so well-loved and ubiquitous, it’s hard to remember a time when it wasn’t readily available and eaten by all. 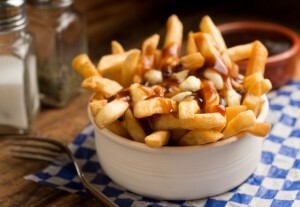 French fries covered in fresh cheese curds and gravy, poutine isn’t for the overly health-conscious, but as far as Canadian comfort foods go, it’s hard to top. 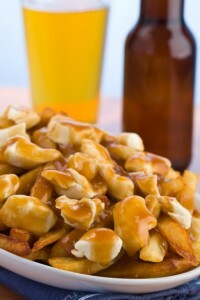 According to legend, the first batch of poutine was ordered from and served by a small restaurant in Quebec back in the late 1950s when a trucker ordered the menu’s French fries and cheese curd in a bag with a side of gravy. Today, the dish is a favorite among Canadians and anyone else lucky enough to try it. If you’re planning a visit to Niagara Falls, and you’d like to experience poutine, here are a handful of restaurants that do it right. Syndicate Restaurant and Brewery serves up gourmet fare that makes use of local farms’ produce, meats, and cheeses as much as possible. While poutine is usually considered pub food or fast food, Syndicate flips the script with duck poutine and manages not to alter the gooey goodness of the dish one bit. Available on their bar menu, fresh-cut fries are smothered in house gravy and fresh cheese curds before being topped with duck confit. If you ever wanted to eat poutine inside a restaurant shaped like a flying saucer, now is your chance. Open for breakfast, lunch, dinner, and late night, Flying Saucer Restaurant is a favorite with locals and visitors of all ages. Order their poutine for a slightly different take on the classic — instead of fresh cheese curds, they use fresh, shredded mozzarella. Michelle’s Fries started out as a food truck, and because they specialize in fries, you can bet their poutine is exceptional. Winner of the “Best Fries” award in Niagara Falls for multiple years, they make a good thing even better. From classic poutine to poutine with hamburger and onions, every variety they serve is delicious. So, bring your fry-loving appetite to Niagara Falls, and indulge in a Canadian classic at one of these five restaurants.